The cysteinyl-leukotrienes (cysLTs) LTC4, LTD4, and LTE4, are involved in a variety of inflammatory diseases, including asthma, and act on at least two distinct receptors, CysLT1 and CysLT2. Specific antagonists of CysLT1 are currently used to control bronchoconstriction and inflammation in asthmatic patients. The potential role of CysLT2 in asthma remains poorly understood. A polymorphism in the CysLT2 gene, resulting in a single amino acid substitution (M201V), was found to be associated with asthma in three separate population studies. Here, we investigated whether the M201V mutation affected the affinity of CysLT2 for its natural ligands and its signaling efficiency. Human embryonic kidney 293 cells were stably transfected with either wild-type (wt) or mutant (M201V) CysLT2. Affinity of the M201V receptor for LTC4 was reduced by 50%, whereas affinity for LTD4 was essentially lost. LTC4-induced production of inositol phosphates (IPs) in M201V-expressing cells was significantly decreased at suboptimal concentrations of the ligand, but no difference was observed at high concentrations. In contrast, LTD4-induced IP production was 10- to 100-fold less in M201V- than in wt-expressing cells. Similar results were also observed with the transactivation of the interleukin-8 promoter induced by LTC4 or LTD4. Moreover, in contrast to wt-expressing cells, phosphorylation of nuclear factor κB p65 was absent in LTD4-stimulated M201V-expressing cells. Likewise, phosphorylation of c-Jun N-terminal kinase was not induced in LTD4-stimulated M201V cells, whereas activation of extracellular response kinase and p38 was maintained, at least at higher LTD4 concentrations. Our results indicate that the M201V polymorphism drastically affects CysLT2 responses to LTD4 and less to LTC4. Cysteinyl-leukotrienes (cysLTs), which include LTC4, LTD4, and LTE4, are lipid mediators of inflammation, derived from arachidonic acid through the 5-lipoxygenase pathway (Samuelsson, 1983). They are involved in a variety of inflammatory diseases, such as asthma and allergic rhinitis (Capra et al., 2007) and are produced mainly by leukocytes (eosinophils, mast cells, etc.) and endothelial cells (Folco and Murphy, 2006; Jiang et al., 2007). CysLTs act on at least two distinct G protein-coupled receptors (GPCRs), namely CysLT1 and CysLT2. These receptors share only 38% homology in amino acid sequence (Lynch et al., 1999; Sarau et al., 1999; Heise et al., 2000; Nothacker et al., 2000; Takasaki et al., 2000). CysLT1 is abundantly expressed in human lung smooth muscle cells and peripheral blood monocytes and eosinophils (Figueroa et al., 2001). The rank order affinity of cysLTs for CysLT1 was reported as LTD4 > LTC4 ≫ LTE4, and this receptor is coupled mainly to Gαq. Specific antagonists of CysLT1, such as montelukast, zafirlukast, and pranlukast, are currently used to control bronchoconstriction and inflammation in asthmatic patients (Sarau et al., 1999; Bäck, 2002). The CysLT2 receptor may also be involved in asthma, although its role and signaling remain poorly understood. Its implication in a number of inflammatory diseases has been suggested in several studies (Lotzer et al., 2003; Beller et al., 2004; Hui et al., 2004; Rovati and Capra, 2007). Furthermore, the gene encoding for the CysLT2 receptor is localized on chromosome 13q14 near a locus associated with atopic asthma (Heise et al., 2000). However, specific CysLT2 receptor antagonists have not been developed as yet, but a leukotriene analog, 4-[[(1R,2E,4E,6Z,9Z)-1-[(1S)-4-carboxy-1-hydroxybutyl]-2,4,6,9-pentadecatetraenyl]thio]-benzoic acid (BAY u9773), is a weak dual CysLT1/CysLT2 antagonist that is also a partial agonist of CysLT2 (Nothacker et al., 2000; Thompson et al., 2003). The rank order affinity of cysLTs for CysLT2 is LTC4 = LTD4 ≫ LTE4, as demonstrated by binding studies (Heise et al., 2000; Nothacker et al., 2000; Takasaki et al., 2000). The highest levels of mRNA expression of CysLT2 were reported in interstitial lung macrophages, peripheral blood leukocytes, heart, adrenal gland, central nervous system, and placenta. CysLT2 mRNA and protein expression can be regulated by cytokines. The expression is up-regulated by the T helper 2 cytokine IL-4 in mast cells and human umbilical vein endothelial cells and down-regulated by tumor necrosis factor α and IL-1β (Lotzer et al., 2003; Mellor et al., 2003). In addition, in eosinophils, CysLT2 expression can be up-regulated by interferon γ (Fujii et al., 2005). The activation of CysLT2 was reported to play a role in inflammation, thrombosis, and atherosclerosis (Rovati and Capra, 2007). CysLT2 is coupled mainly to Gαq but also to Gαi (Mellor et al., 2003; Uzonyi et al., 2006). LTC4 and LTD4 seem to be equipotent in terms of calcium mobilization when acting on CysLT2 (Nothacker et al., 2000). CysLT2 signaling can also induce the activation of genes such as IL-8, P-selectin, and CXC chemokine ligand 2 (McIntyre et al., 1986; Pedersen et al., 1997; Uzonyi et al., 2006; Thompson et al., 2008). IL-8 is a cytokine/chemokine implicated in inflammation, and its major role resides in the recruitment and activation of neutrophils (Harada et al., 1994). Its promoter region is well characterized and contains several transcription sites, including binding sequences for NF-κB, AP-1, and NF-IL-6, which can control the regulation of IL-8 expression (Hoffmann et al., 2002). We have shown previously that NF-κB and AP-1 were necessary for induction of IL-8 promoter transactivation and protein synthesis when CysLT2 was activated by LTC4 (Thompson et al., 2008). It is noteworthy that a polymorphism in the CysLT2 gene, resulting in a single amino acid substitution (M201V), was found in three separate population studies. First, the M201V CysLT2 variant has been observed in the Tristan da Cunha population to be associated with atopy (Thompson et al., 2003). In another study, the CysLT2 variant has been reported to be associated with asthma in a white and an African-American population (Pillai et al., 2004). Those two articles also demonstrated that the M201V polymorphism decreased responsiveness to LTD4 in terms of calcium mobilization. We hypothesized that the M201V mutation could affect the affinity of CysLT2 for its natural ligands and/or its signaling efficiency. We thus investigated the affinity of wild-type (wt) and mutant (M201V) CysLT2 for LTC4 and LTD4 and the signaling events that were induced by ligand stimulation, using human embryonic kidney (HEK) 293 cells stably transfected with either wt or mutant CysLT2. 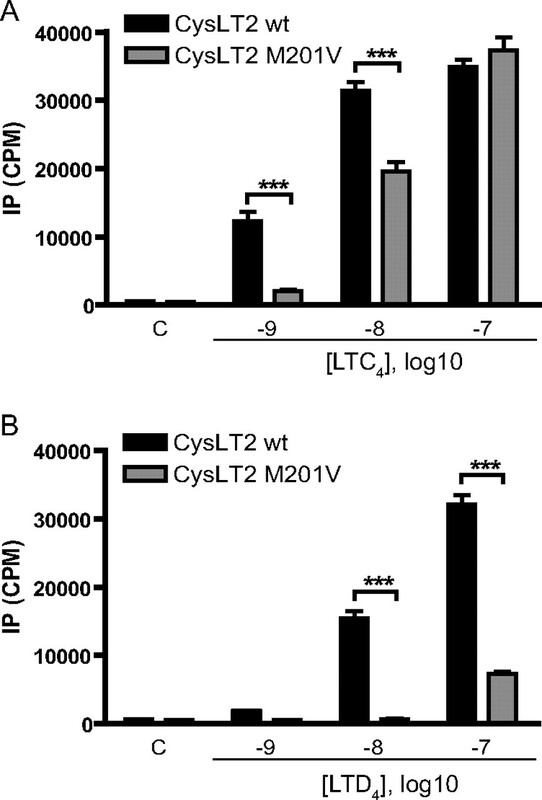 Our results indicate that the M201V polymorphism drastically reduces CysLT2 responses to LTD4, more than to LTC4, and affects selective signaling pathways. LTC4 and LTD4 were obtained from Cayman Chemical (Ann Arbor, MI). [3H]LTC4 and [3H]LTD4 were purchased from PerkinElmer Life and Analytical Sciences (Waltham, MA). [3H]myo-inositol was obtained from Amersham Biosciences (Baie d'Urfé, Canada), and Dowex AG1-X8 columns was from Bio-Rad Laboratories (Mississauga, Canada). Specific antibodies against p-p65 Ser536, Erk1/2, p-p38 Thr180/Tyr182, and p-JNK Thr183/Tyr185 were from Cell Signaling Technology (Danvers, MA), and antibodies against p65, p-ERK, p38, and JNK were obtained from Santa Cruz Biotechnology, Inc. (Santa Cruz, CA). The anti-cMyc antibody (clone 9E10) was from American Type Culture Collection (Manassas, VA), and the fluorescein-conjugated goat anti-mouse antibody was obtained from Jackson ImmunoResearch Laboratories Inc. (West Grove, PA). Aprotinin, 4-(2-aminoethyl)benzenesulfonyl fluoride, leupeptin, NaF, soybean trypsin inhibitor, Na3VO4, and fetal bovine serum were from Sigma-Aldrich (Oakville, QC Canada). TransIT-LT1 was purchased from Mirus Bio LLC (Madison), and Dulbecco's modified Eagle's medium (DMEM; high glucose) was from Invitrogen, Burlington, Canada. pIRESpuro3a-cmyc-CysLT2wt or pIRESpuro3a-cmyc-CysLT2M201V encoding for cMyc-labeled human CysLT2 wt receptor or cMyc-labeled human CysLT2 M201V receptor were puromycin resistant (under the control of a cytomegalovirus promoter) and were constructed in our laboratory. The human IL-8 promoter luciferase construct hIL-8/luc (−162/+44) was a kind gift from Dr. Allan R. Brasier (University of Texas Medical Branch, Galveston, TX) and was used as described by Thompson et al. (2008). HEK293 cells (American Type Culture Collection) were cultured in DMEM with high glucose, supplemented with 5% fetal bovine serum, penicillin (100 μg/ml), and streptomycin (100 μg/ml). Transient transfections were carried out with TransIT-LT1, and experiments were performed 48 h after transfection. HEK-293 Stably Expressing CysLT2 wt or CysLT2 M201V. HEK-293 cells were stably transfected with pIRESpuro3a-cmyc-CysLT2wt or pIRESpuro3a-cmyc-CysLT2M201V (1 μg of linearized DNA) using TransIT-LT1 (3 μl). Forty-eight hours after transfections, puromycin was added at a final concentration of 10 μg/ml. Cells were then cultured until 100% confluence in medium containing puromycin and isolated for clonal selection. Cell clones were analyzed for cMyc expression by FACScan flow cytometer (BD Biosciences, San Jose, CA). Positive clones were maintained in 10 μg/ml puromycin and referred to as CysLT2 wt or CysLT2 M201V. For adequate comparison in our studies, clones expressing equivalent levels of wt or M201V CysLT2 were used. When CysLT2 wt and CysLT2 M201V cells were near 100% of confluence, they were harvested and used for the binding assays. For saturation binding assays, cells (750,000 cells) were incubated in the buffer (Tris, pH 7.4, 10 mM CaCl2, 10 mM MgCl2, 10 mM glycine, 10 mM cysteine, and 0.1% bovine serum albumin) with 0.1 to 12 nM [3H]LTC4 or 0.1 to 15 nM [3H]LTD4 for 1 h at 25°C. After incubation, cells were washed by the addition of buffer followed by a spin to remove the nonspecific radioactivity. After three washes, cells were added to a liquid scintillation β-counter (LKB-Wallac) to measure the radioactivity. Nonspecific binding was determined in the presence of 2 μM unlabeled LTC4 or LTD4. LTC4 or LTD4-specific binding was calculated by subtracting nonspecific binding from total binding. Data were analyzed by nonlinear transformation analysis using Prism software (GraphPad Software, Inc., San Diego, CA). CysLT2 wt and CysLT2 M201V cells were labeled with [3H]myo-inositol in DMEM without inositol for 16 h. The next day, cells were incubated in DMEM, 0.1% bovine serum albumin, and 20 mM LiCl for 10 min and then stimulated for 45 min with LTC4, LTD4, or EtOH at the indicated concentrations. The reactions were terminated by the addition of cold perchloric acid and after an incubation of 30 min on ice, inositol phosphates (IPs) were extracted and separated on Dowex AG 1-X8 columns. Total labeled IPs were then counted by liquid scintillation in an LKB-Wallac β-counter. CysLT2 wt and CysLT2 M201V cells were plated in 12-well tissue culture plates for 24 h. The cells were then transfected with 25 ng of IL-8 WT/luc or empty vector per well, using 0.75 μl of TransIT-LT1 transfection reagent. After 24 h, cells were serum-starved overnight before stimulation with LTC4, LTD4, or EtOH for 6 h. Cell lysates were assayed for luciferase activity using the Dual-Glo luciferase system (Promega, Madison, WI). This assay was carried out as described by Thompson et al. (2008). In brief, CysLT2 wt and CysLT2 M201V cells in six-well plates were incubated in medium with 0.2% serum for 16 h and stimulated with LTC4, LTD4 or EtOH for the indicated times or concentrations. Stimulated cells were lysed in buffer [10 mM Tris, pH 7.4, 10 mM NaCl, 3 mM MgCl2, 0.5 mM EDTA, 0.5 mM EGTA, 5% sodium deoxycholate, 10% Triton X-100, 10 mM NaF, 100 μg/ml 4-(2- aminoethyl)benzenesulfonyl fluoride, 1 μg/ml leupeptin, 2 μg/ml aprotinin, 10 μg/ml soybean trypsin inhibitor, 1 mM Na3VO4, 1 nM Calyculin A, and 15 nM okadaic acid] for 30 min on ice. Lysates were separated on 8 or 10% SDS-polyacrylamide gel electrophoresis and transferred to Trans-Blot nitrocellulose membrane (Bio-Rad Laboratories, Hercules, CA). After blocking and incubation with specific antibodies overnight, membranes were washed and incubated with horseradish peroxydase-labeled secondary antibodies. For protein detection, enhanced chemiluminescence detection was used (GE Healthcare, Chalfont St. Giles, Buckinghamshire, UK). Signal intensity was quantitated by densitometry (Epson Expression 1680 scanner; Epson America, Torrance, CA) and analyzed using Image J 1.38X software (National Institutes of Health, Bethesda, MD). After detection, membranes were stripped, washed, and used with the appropriate antibodies for detect total proteins. Statistical significance was assessed using Student's t test or two-way ANOVA with Bonferroni post-tests, as appropriate, using Prism 5.0 (Graph Pad Software Inc.). Differences were considered significant at p ≤ 0.05. Expression of CysLT2 wt and CysLT2 M201V in HEK293 Cells. To study the affinity and the signaling pathways downstream of the CysLT2 receptor or the CysLT2 receptor with the M201V mutation, we needed a cell line that expresses neither CysLT1 nor CysLT2 receptors. We used the HEK293 cells to generate a cell line that stably expresses only the CysLT2 receptor or the CysLT2 M201V receptor, as described under Materials and Methods. Cell surface expression of the CysLT2 protein was equivalent in both cell lines: geometric mean fluorescence intensity of 2.214 for CysLT2 wt and 2.788 for CysLT2 M201V cells (data not illustrated). Empty vector-transfected HEK293 cells expressed no CysLT2 receptor and showed no response to LTC4 or LTD4 stimulation (data not shown). [3H]LTC4 and [3H]LTD4 Binding Characterization. Saturation binding assays were performed with [3H]LTC4 or [3H]LTD4 using whole CysLT2 wt or CysLT2 M201V cells. High-affinity binding for [3H]LTC4 was observed in CysLT2 wt cells, (Kd = 8.4 nM; Bmax = 8061 binding sites/cell) and CysLT2 M201V cells (Kd = 17.3 nM; Bmax = 3961 binding sites/cell), as shown in Fig. 1, A and B. As for LTD4, high-affinity binding was observed for CysLT2 wt (Kd = 4.2 nM; Bmax = 1037 binding sites/cell), whereas binding to CysLT2 M201V was undetectable (Fig. 1, C and D). These results suggest that the M201V mutation affects particularly the affinity of the CysLT2 receptor for LTD4 in spite of equivalent amounts of CysLT2 receptor protein expressed in the wt and mutant cell lines. 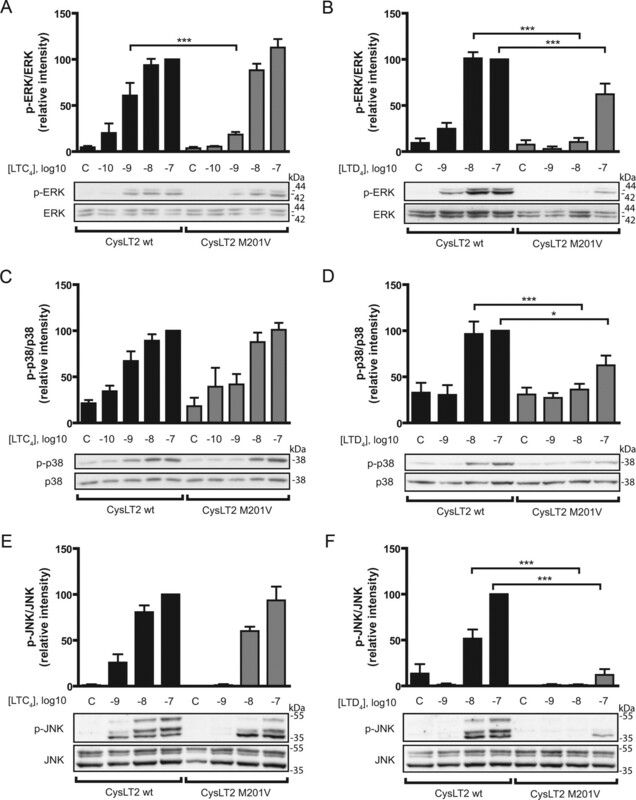 Radioligand binding studies of LTC4 or LTD4 with CysLT2 wt or CysLT2 M201V cells. A and B, saturation binding isotherms for [3H]LTC4 to CysLT2 wt (A) or CysLT2 M201V (B). Radioligand binding assay was performed with increasing amounts of [3H]LTC4 (0.1–12 nM) in the presence or absence of unlabeled ligand. C and D, saturation binding isotherms for [3H]LTD4 to CysLT2 wt (C) or CysLT2 M201V (D). Radioligand binding assay was performed with increasing amounts of [3H]LTD4 (0.1–15 nM) in the presence or absence of unlabeled ligand. The calculated specific binding was analyzed by nonlinear transformation using Prism (Graph Pad Software, Inc.) to generate Kd and Bmax values. Saturation curves are representative of four independent experiments. Insets, Scatchard representation of the specific binding isotherm. Inositol Phosphate Production in CysLT2 wt and CysLT2 M201V Cells. The M201V variant was shown to respond to LTD4 5-fold less than the wt receptor in terms of calcium mobilization (Thompson et al., 2003; Pillai et al., 2004). To assess whether this was associated with a reduction in IP production, CysLT2 wt or CysLT2 M201V cells were stimulated for 45 min with graded concentrations of LTC4 or LTD4. As shown in Fig. 2, both LTC4 and LTD4 induced IP production in a concentration-dependent manner in CysLT2 wt cells. It is noteworthy that LTC4 was more potent than LTD4. In CysLT2 M201V cells, LTC4 also induced an IP production in a concentration-dependent manner (Fig. 2A). However, this production was significantly decreased at lower (1 and 10 nM) concentrations and became equivalent to that of CysLT2 wt cells at 100 nM LTC4. In contrast, LTD4 induced only very low IP production and only at 100 nM (Fig. 2B). Effect of cysLTs on IP production by CysLT2 wt (black bars) or CysLT2 M201V (gray bars) cells. Cells were labeled with [3H]myo-inositol for 16 h, and then stimulated for 45 min with EtOH and LTC4 (A) or LTD4 (B) at the indicated concentrations before measurement of radioactivity. Results are presented as cpm of inositol phosphate production. Data are expressed as means ± S.E. of 15 (A) or 9 (B) independent experiments. Lane C, control using EtOH (100 nM). ***, p < 0.001, using two-way ANOVA with Bonferroni post-tests. IL-8 Promoter Activity in CysLT2 wt or CysLT2 M201V Cells. In a previous study, LTC4 and LTD4 had been shown to up-regulate IL-8 gene expression and protein synthesis in HEK293 cells transfected with CysLT2 wt (Thompson et al., 2008). To investigate the effects of the M201V mutation on IL-8 promoter activity, CysLT2 wt or CysLT2 M201V cells were transfected with a luciferase reporter gene driven by the IL-8 promoter and stimulated with LTC4 or LTD4, and the luciferase activity was then measured. As shown in Fig. 3A, LTC4 induced IL-8 transactivation in a concentration-dependent manner in CysLT2 wt cells after a stimulation of 6 h. In these cells, LTD4 also up-regulated IL-8 promoter activity (Fig. 3B). It is noteworthy that, as with IP production, LTC4 was more potent than LTD4 and induced an equivalent level of IL-8 promoter transactivation at 10-fold lower concentrations. As shown in Fig. 3A, LTC4 also induced a concentration-dependent IL-8 transactivation in CysLT2 M201V cells. However, this promoter activity was significantly decreased at lower concentrations of LTC4 and became equivalent to that of the wt receptor only at 100 nM. Finally, LTD4 induced very little IL-8 transactivation in CysLT2 M201V cells and only at a concentration of 100 nM in these cells (Fig. 3B). Effect of cysLTs on IL-8 promoter transactivation in CysLT2 wt (black bars) or CysLT2 M201V (gray bars) cells. Cells were transiently transfected with pIL-8 promoter constructs. Cells were incubated for 6 h with EtOH and LTC4 (A) or LTD4 (B) at the indicated concentrations before measurement of luciferase activity. Data are expressed as fold increase relative to EtOH control. **, p < 0.01 and ***, p < 0.001, using two-way ANOVA with Bonferroni post-tests (n = 4). NF-κB Pathway Activation in CysLT2 wt or CysLT2 M201V Cells. Because LTC4-induced IL-8 promoter activity had been shown to involve mainly NF-κB and AP-1 binding sites (Thompson et al., 2008), we tested whether p65 phosphorylation would be differentially induced in CysLT2 wt and M201V cells. As shown in Fig. 4A, LTC4 at 10 nM induced a time-dependent p65 phosphorylation in CysLT2 wt cells, with a maximal induction at 15 min. Similar results were observed with LTD4 at 100 nM in CysLT2 wt cells (Fig. 4B). 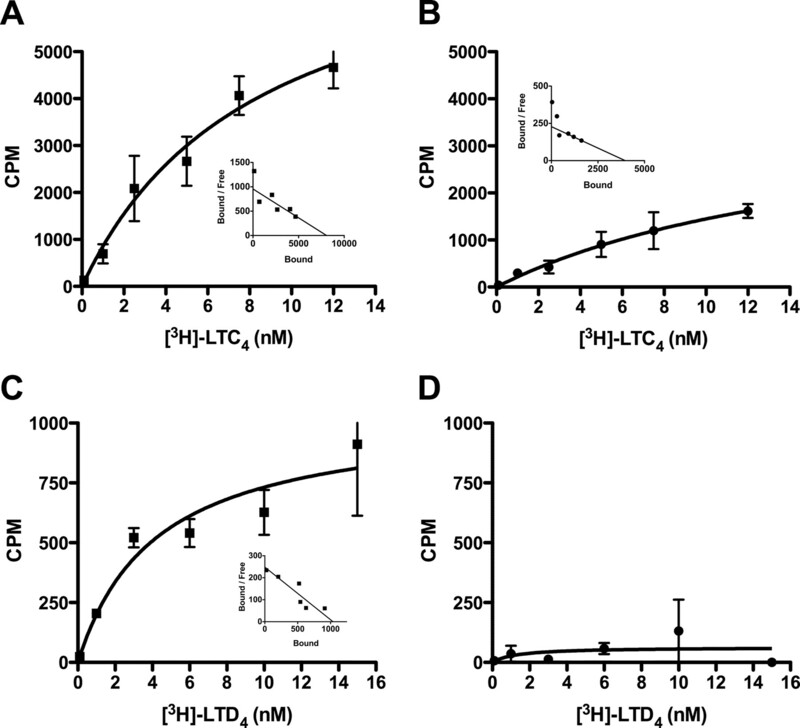 Furthermore, LTC4 and LTD4 produced a concentration-dependent phosphorylation of the p65 in CysLT2 wt cells with maximal activation at 100 nM (Fig. 4, C and D). In CysLT2 M201V cells, LTC4 induced p65 phosphorylation at 15 min, but it was significantly lower than in CysLT2 wt cells (Fig. 4, A and C), except at the highest concentration of LTC4 (Fig. 4C). In contrast, LTD4 failed to activate the p65 NF-κB subunit in CysLT2 M201V cells at all times and concentrations used (Fig. 4, B–D). Effect of cysLTs on p65 phosphorylation in CysLT2 wt (black bars) or CysLT2 M201V (gray bars) cells. A and B, kinetics. Cells were stimulated with EtOH and LTC4 (A) or LTD4 (B) at 10 nM for LTC4 and 100 nM for LTD4 for the indicated times. Total proteins were separated by electrophoresis, and Western blots were performed using the indicated antibodies. Total p65 protein expression was used as internal control. Data are reported as relative intensity of p-p65 over p65 with the CysLT2 wt response at 15 min set to 100. C and D, concentration-response. Cells were stimulated for 15 min with EtOH and LTC4 (C) or LTD4 (D) at the indicated concentrations. Data are reported as relative intensity of p-p65 over p65 with the CysLT2 wt response at 100 nM set to 100. Lane C, control using EtOH (100 nM). *, p < 0.05; **, p < 0.01; ***, p < 0.001, using two-way ANOVA with Bonferroni post-tests (n = 3–4). MAPK Pathway Activation in CysLT2 wt or CysLT2 M201V Cells. Because of the implication of AP-1 in IL-8 transactivation, we studied the activation of MAPK pathway elements by CysLT2 wt and CysLT2 M201V. As illustrated in Fig. 5A, LTC4 induced a time-dependent ERK phosphorylation with a maximal induction at 5 min in CysLT2 wt cells. This activation of ERK by LTC4 was concentration-dependent in CysLT2 wt cells and was maximal at 10 to 100 nM (Fig. 6A). In these cells, LTD4 induced a more protracted ERK phosphorylation (Fig. 5B), with a maximal stimulation at 10 nM LTD4 (Fig. 6B). In CysLT2 M201V cells, LTC4 induced also a time-dependent ERK activation with a maximal induction at 5 min (Fig. 5A). However, this activation decreased more rapidly after 15 min. Similar results were obtained with LTD4 stimulation in CysLT2 M201V cells (Fig. 5B). As shown in Fig. 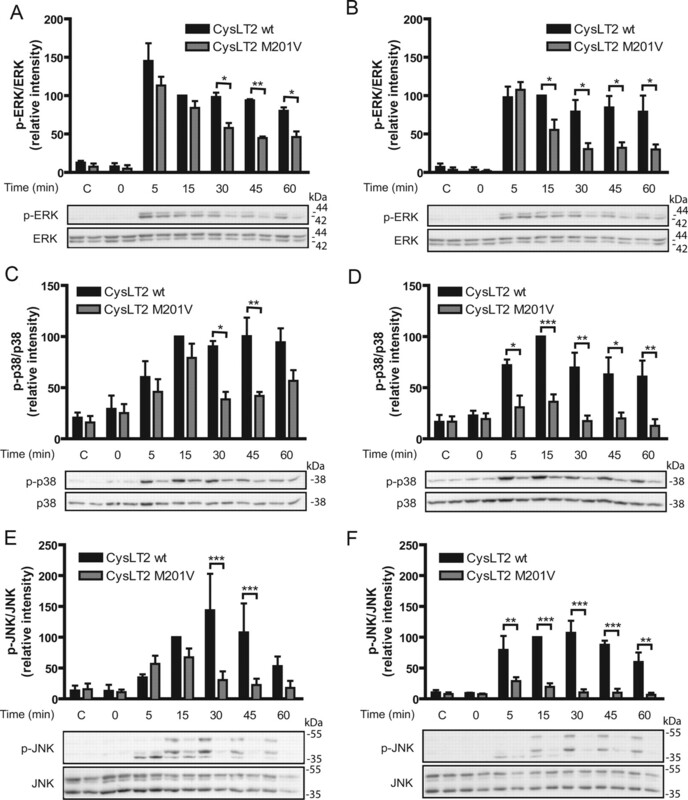 6A, LTC4 induced a concentration-dependent ERK phosphorylation in CysLT2 M201V cells that was similar to the activation in CysLT2 wt cells, except at 1 nM. As for LTD4, stimulation of CysLT2 M201V cells induced ERK phosphorylation only at 100 nM (Fig. 6B). 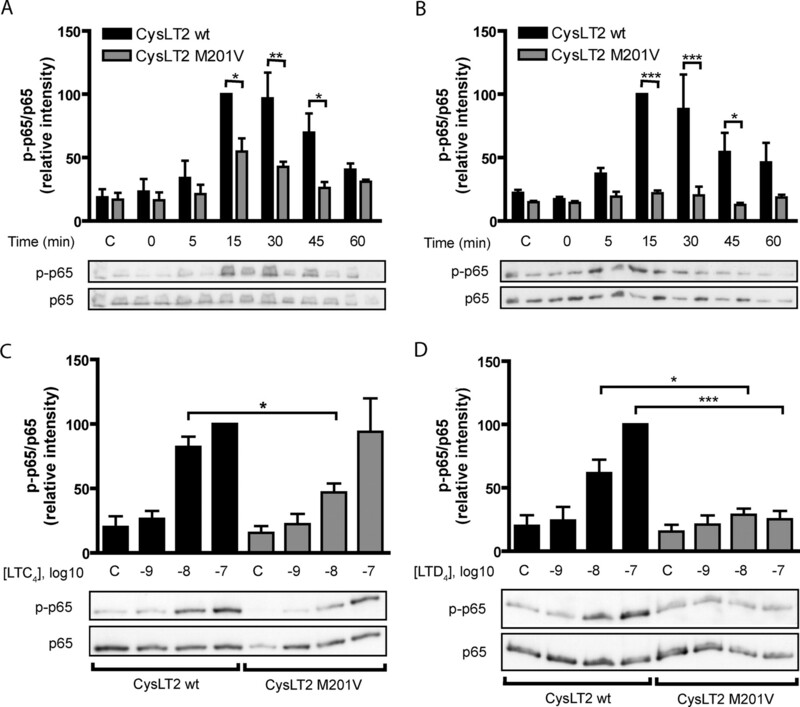 Time-dependent effects of cysLTs on the MAPK pathway in CysLT2 wt (black bars) or CysLT2 M201V (gray bars) cells. Cells were stimulated with EtOH and LTC4 (A, C, and E) or LTD4 (B, D, and F) at 10 nM for LTC4 and at 100 nM for LTD4 for the indicated times. Total proteins were separated by electrophoresis, and Western blots were performed using the indicated antibodies. Total ERK (A and B), p38 (C and D), or JNK (E and F) protein expression was used as internal control. Data are reported as relative intensity of phosphorylated protein over total protein with the CysLT2 wt response at 15 min set to 100. Lane C, control using EtOH (100 nM). *, p < 0.05; **, p < 0.01; ***, p < 0.001, using two-way ANOVA with Bonferroni post-tests (n = 3–4). Concentration-dependent effects of cysLTs on the MAPK pathway in CysLT2 wt (black bars) or CysLT2 M201V (gray bars) cells. Cells were stimulated for 15 min with EtOH and LTC4 (A, C, and E) or LTD4 (B, D, and F) at the indicated concentrations. Total proteins were separated by electrophoresis, and Western blots were performed using the indicated antibodies. Total ERK (A and B), p38 (C and D), or JNK (E and F) protein expression was used as internal control. Data are reported as relative intensity of phosphorylated protein over total protein with the CysLT2 wt response at 100 nM set to 100. Lane C, control using EtOH (100 nM). *, p < 0.05; ***, p < 0.001, using two-way ANOVA with Bonferroni post-tests (n = 3–9). In CysLT2 wt cells, LTC4 induced a time-dependent p38 activation with a plateau from 15 to 60 min (Fig. 5C). LTD4 also produced a time-dependent p38 activation in CysLT2 wt cells, with a maximal activation at 15 min (Fig. 5D). At 15 min, LTC4 and LTD4 induced a concentration-dependent p38 phosphorylation that was very similar to that of ERK in CysLT2 wt cells (Fig. 6, C and D). In CysLT2 M201V cells, LTC4 produced a time-dependent p38 activation with a maximal induction at 15 min (Fig. 5C). However, this activation was significantly lower at 30 and 45 min compared with that in CysLT2 wt cells. On the other hand, whereas LTC4 induced a concentration-dependent p38 phosphorylation in CysLT2 M201V cells that was similar to that in CysLT2 wt cells (Fig. 6C), LTD4 did not induce a significant p38 phosphorylation in CysLT2 M201V cells in contrast to that in CysLT2 wt cells (Figs. 5D and 6D). LTC4 induced a time-dependent JNK phosphorylation in CysLT2 wt cells with a maximal effect at 30 min (Fig. 5E). LTD4 also induced a time-dependent JNK activation with a peak induction at 30 min but it was less pronounced than with LTC4 (Fig. 5F). LTC4 and LTD4 also induced a concentration-dependent JNK phosphorylation with a maximal activation at 100 nM in CysLT2 wt cells, with LTC4 inducing a greater response than LTD4 at lower concentrations (Fig. 6, E and F). In CysLT2 M201V cells, LTC4 produced a significant time-dependent JNK phosphorylation with a maximal induction at 15 min (Fig. 5E). However, this effect was significantly decreased at 30 to 60 min compared with CysLT2 wt cells. On the other hand, LTD4 failed to induce any significant JNK phosphorylation in CysLT2 M201V cells at all time points and concentrations used (Figs. 5F and 6F). The M201V polymorphism in the CysLT2 receptor is predicted to be localized in the C-terminal portion of extracellular loop (ECL) 2, adjacent to transmembrane helix (TM) V. Comparison with available crystal structures of GPCRs (Palczewski et al., 2000; Rasmussen et al., 2007; Warne et al., 2008) indicates that the residues corresponding to Met201 may contact the junction between the end of TM IV and the beginning of ECL2. Moreover, according to this analysis, Met201 would be located in the first helical turn of TM V. Considering that, compared with Met, Val has a shorter and β-branched side chain, it is quite possible that the M201V mutation would perturb the local secondary structure, because of its lower propensity for helix formation and/or the tertiary contacts present in the wt receptor. The roles of residues in the ECL of GPCR are not well understood, although they seem to be functionally important. In particular, ECL2, which links TM IV and V, has been shown to project into the TM bundle where ligand binding occurs (Palczewski et al., 2000; Li et al., 2004; Shi and Javitch, 2004). Because ECL2 is known to play an important role in ligand binding in certain receptors (Boucard et al., 2000; Rasmussen et al., 2007; Warne et al., 2008), a modulation in affinity toward LTC4 and LTD4 caused by this mutation is not unexpected. The binding site of cysteinyl leukotrienes to either of their receptors has not been determined. However, it has been shown that LTB4, a leukotriene lacking the cysteinyl moiety, uses, when binding to its high-affinity receptor (BLT1), residues in the C-terminal part of the ECL2 and TM5, regions possibly affected by the M201V mutation (Gearing et al., 2003; Sabirsh et al., 2006; Basu et al., 2007). In addition to a role in ligand binding, the ECL2 region may have a role in receptor activation. Mutations targeting ECL2 modulate both ligand-dependent and -independent receptor activation (Banères et al., 2005; Klco et al., 2005; Scarselli et al., 2007). For instance, polar residues within TMs of BLT1 play an important role in signal transduction after ligand-induced conformational changes (Basu et al., 2007). Moreover, studies of ECL2 of GPCR for small peptides or biogenic amines (e.g., the V1a vasopressin receptor and the M3 muscarinic acetylcholine receptor) revealed the presence of several residues that were important for efficient agonist-induced receptor activation (Conner et al., 2007; Scarselli et al., 2007). Thus the conformational change in M201V may, in addition to an effect on ligand affinity, modulate the activational capacity of the receptor. Using HEK293 cells that stably expressed equivalent levels of the CysLT2 wt or the CysLT2 M201V receptor, we have shown that the M201V mutation decreased the affinity of the CysLT2 receptor for LTC4 by 50% and to an undetectable level for LTD4, using tritiated ligands. This polymorphism also affected the signaling efficiency of CysLT2. It impaired the production of IPs, the transactivation of the IL-8 promoter, and the phosphorylation of p65, ERK, p38, and JNK. CysLT2 responses to LTD4 were much more affected than those to LTC4, with p65 and JNK signaling pathways being more affected than ERK and p38. The localization of this polymorphism at the junction of ECL2 and TMV of the CysLT2 receptor may thus be in a position that can alter ligand binding and receptor signaling. The two groups that initially reported the association of the M201V polymorphism with atopy and asthma found LTD4 to be 2- to 4-fold less potent in inducing Ca2+ mobilization in cells expressing CysLT2 M201V compared with CysLT2 wt (Thompson et al., 2003; Pillai et al., 2004). Responses to LTC4 were not decreased, however, but their cells were transiently transfected and levels of expression of the respective receptors were not indicated. Nevertheless, the drastically decreased IP production that we observed in M201V cells in response to LTD4 correlates well with the reported decrease in Ca2+ mobilization. In addition, however, we found responses to LTC4 to be reduced at suboptimal concentrations. 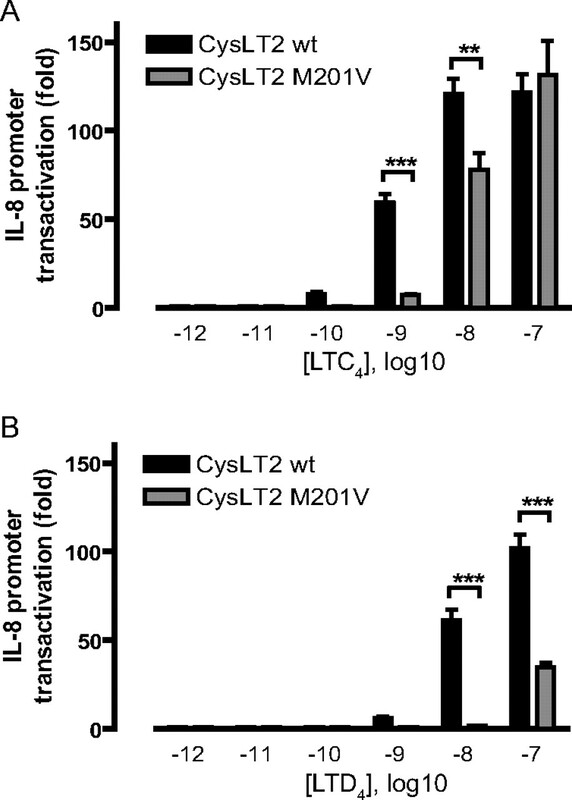 IL-8 promoter transactivation was also markedly reduced in CysLT2 M201V-expressing cells. IL-8 (CXC chemokine ligand 8) is a cytokine/chemokine implicated in inflammation and is associated with several pathologies, including asthma (Harada et al., 1994; Norzila et al., 2000; Ordonez et al., 2000; Gibson et al., 2001). IL-8 is usually regulated at the transcriptional level through promoter regions that bind NF-κB, AP-1, and NF-IL-6 (Hoffmann et al., 2002). We have previously shown that CysLT2 activation by LTC4 or LTD4 can induce IL-8 promoter transactivation and IL-8 protein synthesis and that NF-κB and AP-1 response elements were essential and sufficient for IL-8 transactivation by LTC4 in CysLT2 wt cells(Thompson et al., 2008). We therefore addressed the impact of the M201V mutation on the activation of NF-κB and AP-1. In CysLT2 wt cells, all pathways studied (p65, ERK, p38, and JNK) could be activated by LTC4 or LTD4 in a time- and concentration-dependent manner. The M201V mutation caused a differential modulation in the activation of these four pathways after stimulation by LTs. For LTC4, the activation of JNK and p65 was more affected by the mutation than the activation of ERK and p38. However, at early times (5–15 min) and higher concentrations (10–100 nM), the mutation had essentially no effect on the activation of p65, ERK, p38, or JNK by LTC4. This is consistent with the results of IL-8 promoter transactivation where the polymorphism affected the response only at suboptimal concentrations of LTC4. In contrast, for all stimulation periods and all concentrations used, LTD4 failed to activate p65 and JNK in CysLT2 M201V-expressing cells. Phosphorylation of p38 was also markedly impaired, whereas phosphorylation of ERK was relatively less affected. Moreover, the activation of ERK and p38 was equivalent in both cell lines at higher LTD4 concentrations. This is in concordance with the results of IL-8 gene activation, where the M201V mutation abolished IL-8 promoter transactivation at all concentrations of LTD4 except the highest (100 nM). At this highest LTD4 concentration, IL-8 promoter transactivation may have been caused by the activation of ERK and p38. The present study has defined certain elements of CysLT2 signaling that are impaired or lost with the M201V mutation. Because the study by Pillai et al. (2004) has shown that the polymorphism was significantly undertransmitted to asthmatics, the authors suggested that this mutation would have a protective effect in asthma. It would indicate that inhibiting CysLT2 signaling, similar to blocking CysLT1 signaling as is currently done with selective antagonists, would constitute a potentially useful therapeutic target against asthma. On the other hand, the study by Thompson et al. (2003) demonstrated that the polymorphism was associated with atopy. In this case, inhibiting CysLT2 signaling could lead to enhanced allergic response and would be deemed undesirable. In a separate work, we have cotransfected CysLT1 with either CysLT2 wt or CysLT2 M201V in HEK293 cells and have not found either combination to affect responses to LTC4 or LTD4 (S. Véronneau, unpublished observations). Our studies raise several questions concerning the M201V mutation, including whether different G proteins are involved, whether cellular trafficking is affected, and especially what is the mechanism through which it affects LTD4 more than LTC4. In conclusion, the M201V mutation decreases the affinity of the CysLT2 receptor for LTC4 by 50% and radically decreases the affinity for LTD4. This polymorphism also affects the signaling efficiency of CysLT2. It affects the production of IPs, the transactivation of the IL-8 promoter, and the phosphorylation of p65, ERK, p38, and JNK. CysLT2 responses to LTD4 are much more affected than those to LTC4, with p65 and JNK signaling pathways being more affected than ERK and p38. The impact of this mutation on other elements in the physiopathology of asthma remains to be elucidated. Participated in research design: Brochu-Bourque, Véronneau, Rola-Pleszczynski, and Stankova. Conducted experiments: Brochu-Bourque and Véronneau. Contributed new reagents or analytic tools: Véronneau. Performed data analysis: Brochu-Bourque, Rola-Pleszczynski, and Stankova. Wrote or contributed to the writing of the manuscript: Brochu-Bourque, Véronneau, Rola-Pleszczynski, and Stankova. Other: Rola-Pleszczynski and Stankova acquired funding for the research. We thank Dr. Pierre Lavigne (Université de Sherbrooke) for helpful discussions concerning the molecular modeling of the CysLT2 receptor and Marianne Mayhue for expert technical help. (2002) Functional characteristics of cysteinyl-leukotriene receptor subtypes. Life Sci 71:611–622. (2005) Molecular characterization of a purified 5-HT4 receptor: a structural basis for drug efficacy. J Biol Chem 280:20253–20260. (2007) Critical role for polar residues in coupling leukotriene B4 binding to signal transduction in BLT1. J Biol Chem 282:10005–10017. (2004) Targeted gene disruption reveals the role of the cysteinyl leukotriene 2 receptor in increased vascular permeability and in bleomycin-induced pulmonary fibrosis in mice. J Biol Chem 279:46129–46134. (2000) Photolabeling identifies position 172 of the human AT(1) receptor as a ligand contact point: receptor-bound angiotensin II adopts an extended structure. Biochemistry 39:9662–9670. (2007) Cysteinyl-leukotrienes and their receptors in asthma and other inflammatory diseases: critical update and emerging trends. Med Res Rev 27:469–527. (2007) Systematic analysis of the entire second extracellular loop of the V(1a) vasopressin receptor: key residues, conserved throughout a G-protein-coupled receptor family, identified. J Biol Chem 282:17405–17412.
. (2001) Expression of the cysteinyl leukotriene 1 receptor in normal human lung and peripheral blood leukocytes. Am J Respir Crit Care Med 163:226–233. (2006) Eicosanoid transcellular biosynthesis: from cell-cell interactions to in vivo tissue responses. Pharmacol Rev 58:375–388. (2005) Interferon-γ up-regulates expression of cysteinyl leukotriene type 2 receptors on eosinophils in asthmatic patients. Chest 128:3148–3155.
. (2003) Complex chimeras to map ligand binding sites of GPCRs. Protein Eng 16:365–372. (2001) Heterogeneity of airway inflammation in persistent asthma: evidence of neutrophilic inflammation and increased sputum interleukin-8. Chest 119:1329–1336. (1994) Essential involvement of interleukin-8 (IL-8) in acute inflammation. J Leukoc Biol 56:559–564.
. (2000) Characterization of the human cysteinyl leukotriene 2 receptor. J Biol Chem 275:30531–30536. (2002) Multiple control of interleukin-8 gene expression. J Leukoc Biol 72:847–855. (2004) Directed vascular expression of human cysteinyl leukotriene 2 receptor modulates endothelial permeability and systemic blood pressure. Circulation 110:3360–3366. (2007) CysLT2 receptors interact with CysLT1 receptors and down-modulate cysteinyl leukotriene dependent mitogenic responses of mast cells. Blood 110:3263–3270. (2005) Essential role for the second extracellular loop in C5a receptor activation. Nat Struct Mol Biol 12:320–326. (2004) Structure of bovine rhodopsin in a trigonal crystal form. J Mol Biol 343:1409–1438. (2003) Differential leukotriene receptor expression and calcium responses in endothelial cells and macrophages indicate 5-lipoxygenase-dependent circuits of inflammation and atherogenesis. Arterioscler Thromb Vasc Biol 23:e32–36.
. (1999) Characterization of the human cysteinyl leukotriene CysLT1 receptor. Nature 399:789–793. (1986) Leukotrienes C4 and D4 stimulate human endothelial cells to synthesize platelet-activating factor and bind neutrophils. Proc Natl Acad Sci USA 83:2204–2208. (2003) Expression of the type 2 receptor for cysteinyl leukotrienes (CysLT2R) by human mast cells: Functional distinction from CysLT1R. Proc Natl Acad Sci USA 100:11589–11593. (2000) Interleukin-8 secretion and neutrophil recruitment accompanies induced sputum eosinophil activation in children with acute asthma. Am J Respir Crit Care Med 161:769–774. (2000) Molecular cloning and characterization of a second human cysteinyl leukotriene receptor: discovery of a subtype selective agonist. Mol Pharmacol 58:1601–1608. (2000) Increased neutrophil numbers and IL-8 levels in airway secretions in acute severe asthma: Clinical and biologic significance. Am J Respir Crit Care Med 161:1185–1190.
. (2000) Crystal structure of rhodopsin: A G protein-coupled receptor. Science 289:739–745. (1997) Cysteinyl leukotrienes induce P-selectin expression in human endothelial cells via a non-CysLT1 receptor-mediated mechanism. J Pharmacol Exp Ther 281:655–662.
. (2004) A coding polymorphism in the CYSLT2 receptor with reduced affinity to LTD4 is associated with asthma. Pharmacogenetics 14:627–633.
. (2007) Crystal structure of the human β2 adrenergic G-protein-coupled receptor. Nature 450:383–387. (2007) Cysteinyl-leukotriene receptors and cellular signals. ScientificWorldJournal 7:1375–1392. (2006) Residues from transmembrane helices 3 and 5 participate in leukotriene B4 binding to BLT1. Biochemistry 45:5733–5744. (1983) Leukotrienes: mediators of immediate hypersensitivity reactions and inflammation. Science 220:568–575.
. (1999) Identification, molecular cloning, expression, and characterization of a cysteinyl leukotriene receptor. Mol Pharmacol 56:657–663. (2007) Multiple residues in the second extracellular loop are critical for M3 muscarinic acetylcholine receptor activation. J Biol Chem 282:7385–7396. (2004) The second extracellular loop of the dopamine D2 receptor lines the binding-site crevice. Proc Natl Acad Sci USA 101:440–445.
. (2000) The molecular characterization and tissue distribution of the human cysteinyl leukotriene CysLT(2) receptor. Biochem Biophys Res Commun 274:316–322. (2008) Signaling by the cysteinyl-leukotriene receptor 2. Involvement in chemokine gene transcription. J Biol Chem 283:1974–1984.
. (2003) A cysteinyl leukotriene 2 receptor variant is associated with atopy in the population of Tristan da Cunha. Pharmacogenetics 13:641–649.
. (2006) Cysteinyl leukotriene 2 receptor and protease-activated receptor 1 activate strongly correlated early genes in human endothelial cells. Proc Natl Acad Sci USA 103:6326–6331. (2008) Structure of a β1-adrenergic G-protein-coupled receptor. Nature 454:486–491.